Instructions: Finished card is approximately 4 x 6". Stamp the image from Petite Pansy Frame Cling Stamp Set on a piece of watercolor cardstock using Jet Black Archival Ink and color it using Gansai Tambi watercolors. Die cut this colored image using the Petite Pansy Frame Die. 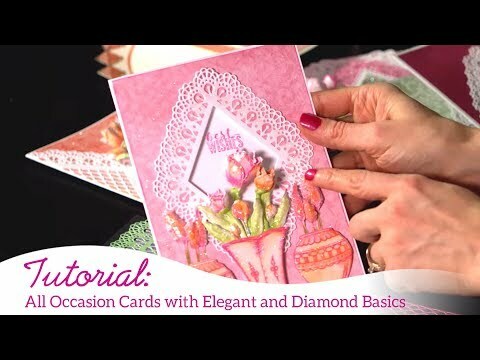 Die cut a piece of white cardstock using the largest die from Diamonds & Lace Die. Cut out the center so that it does not show from the gap inside the colored image from last step. Adhere the colored image on the die cut. Take a 4 1/4" x 3 7/8" side folding card base and stamp the sentiment from Thank You Sentiments Cling Stamp Set using Jet Black Archival Ink in the center. Adhere the diecut from previous step above to the card base as shown. Add a few pearls to the die cut to add finishing touch.